This exercise increases the difficulty of bent knee fall out by adding the soft ball to the pelvis and taking away the support of the feet on the ground. To do this exercise you will need a mat and a soft ball. Start by lying on your back with you pelvis on a soft ball and your legs in a tabletop position. Inhale to prepare and then exhale as you drop one knee to the side. Exhale return that knee to the center and then repeat on the opposite side. Repeat this 8-10 times on each side. The soft ball adds several challenges to this exercise. 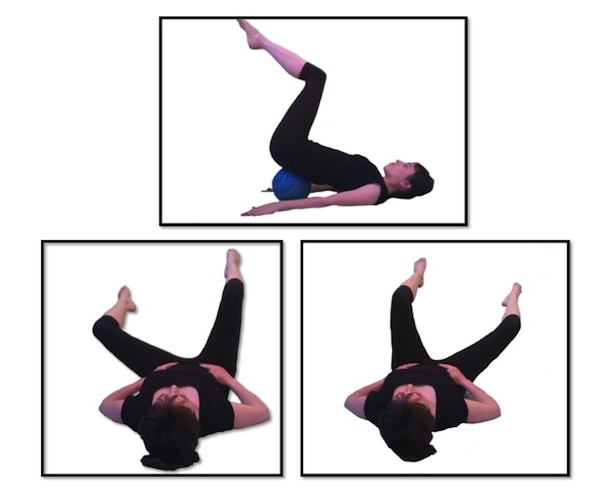 It requires additional abdominal work to keep the pubic bone from dropping to the ground, but is also requires a deep awareness for the oblique abdominal muscles that will keep the pelvis from rolling off of the ball. Unfortunately often when put in this precarious position the pelvis recruits every muscle at its disposal to keep the pelvis still. This includes the muscles that are actually required to allow the legs to move. So now what! Remember the basics. This exercise is about allowing the leg to move in the hip socket. Go back to imagining the top of the femur and the easy glide of the ball and socket joint. Find the deep abdominal muscles to stabilize the pelvis, but do as little work as possible. Find the ease in the movement. Feel graceful as you simply exhale and lower your leg to the ground.